Brunch in Portland is quite the event. There are SO many tried and true brunch favorites in town. I always am looking to try the newest brunch menus, but that comes at a cost…waiting in line. Trust me when I say D is reluctant (at best) to wait in line for breakfast. It’s never an easy sell. SO when I was invited to try Circa 33’s new brunch menu– I was so excited. What was EVEN more exciting- when I headed back 2 weeks later. Amazing brunch my friends..with little wait. Dream come true. I had never been to Circa 33 before, only heard about the amazing bar program. I wasn’t disappointed when we headed over for brunch. The cocktails were on point. I also loved the speakeasy vibes. (there is a secret room behind the bookcase- no joke!). The menu had classic brunch dishes with a Pacific Northwest twist. Everything we tried was fresh, light (hard to do with eggs benedict! ), and SO flavorful. The bloody mary was AMAZING. 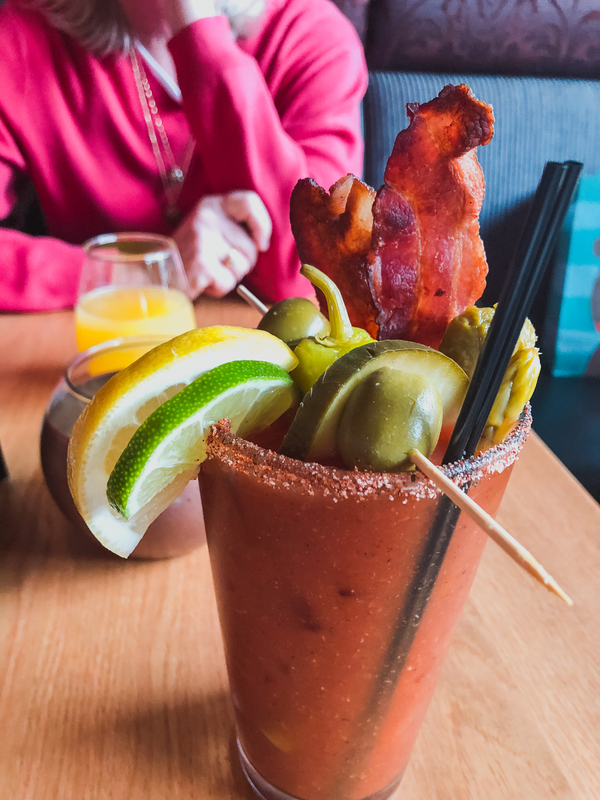 I consider myself a bloody mary aficionado and this one passed my test. Are you seeing that delicious bacon? Don’t miss the Mimosa or the Circa Pimm’s Cup! Dear lorrrrd the Vegetarian Biscuits and Gravy were outstanding. While I love a good sausage gravy, the mushroom gravy was fantastic. 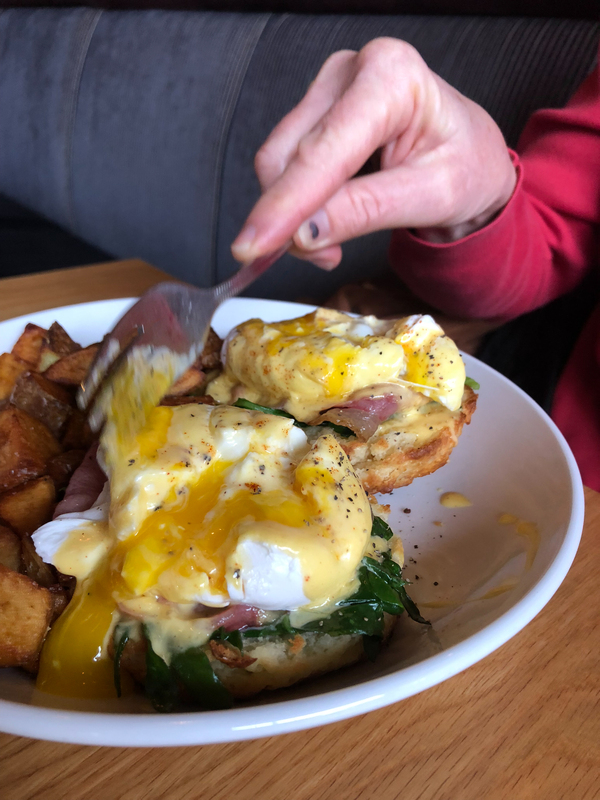 Don’t miss out on the Circa Benedict or the Seasonal Breakfast Sandwich. Truthfully, I saw other people who had different menu items- there are no wrong choices. There you have it- an amazing Portland brunch spot and hopefully little to no wait. If you are like me and brunch is a must on the weekend, check out Circa 33 for brunch. You won’t be disappointed. Thanks to Circa 33 for hosting us- We will be back again! Beautiful photos! Sounds delicious!! I love when nice bars/unexpected places have good brunch, too! Thank you! I really enjoyed the food! OMGOSH I love Cesar’s too!! I need to order those more often. my husband and i are currently planning a portland trip! This looks SO delicious! Thanks for the rec! Great review! 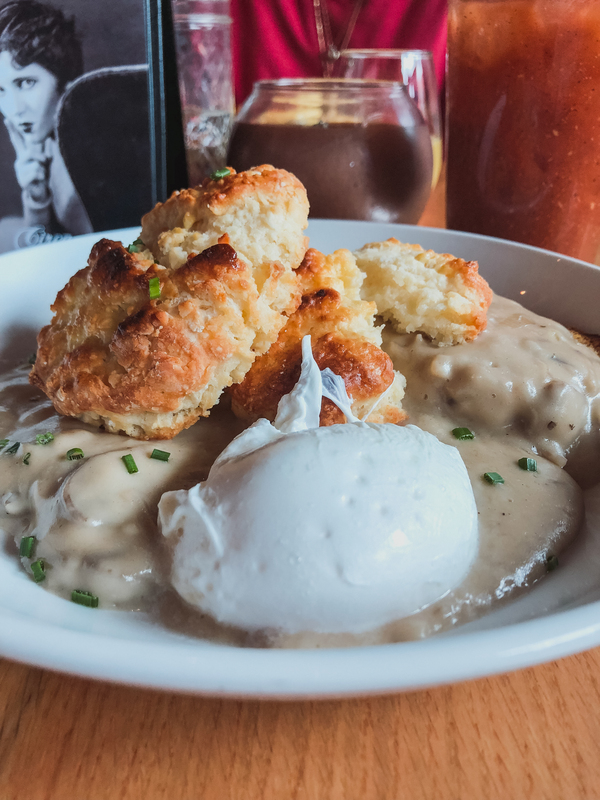 Those biscuits and gravy looks Ah-mazing! This all looks wonderful! Definitely adding to my list of places to see when we visit. I’m also loath to stand in lines for restaurants – I burned out on that while living in NYC where everything is a struggle. 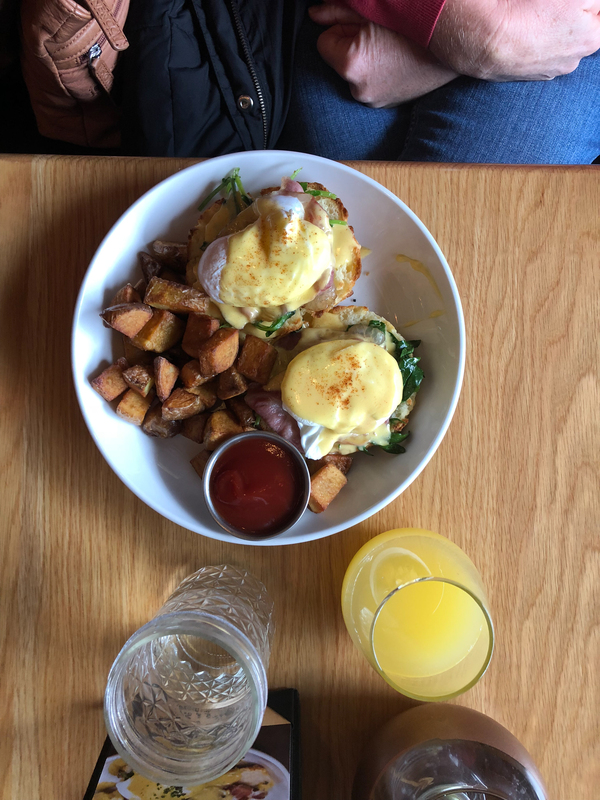 The brunch sounds really good here – love your mouthwatering photos! Well, this place is definitely getting added to my Oregon/PDX brunch list for new places to try! I love bloody Mary’s too and that one looks delicious. 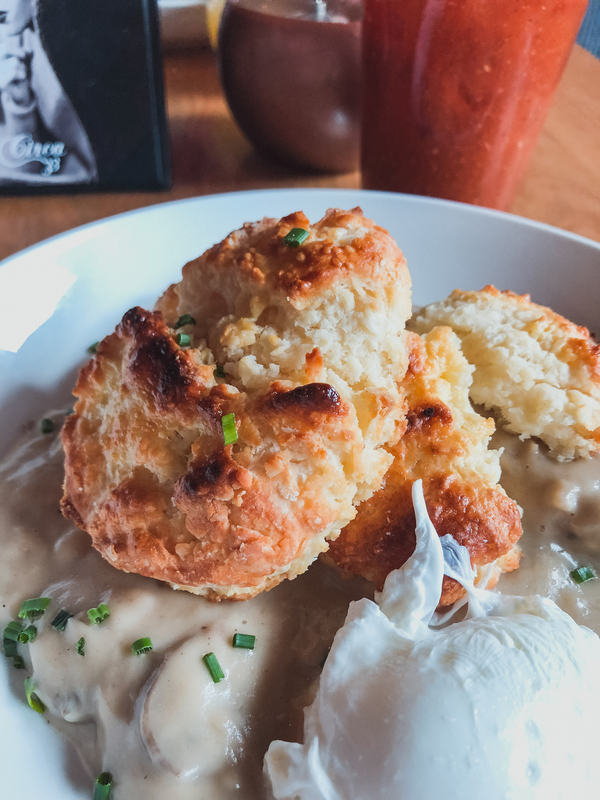 And that biscuits and gravy – yum! I love brunches too and oh my, the food looks so good! Oh my goodness! The food and drinks at Circa 33 look absolutely amazing! I wish I lived near their location. Hands down, that would be my favorite place for brunch!